The University of Queensland is situated in the main loop of the Brisbane River, just 7 km / 4.5 miles to the south of Brisbane city centre. This attractive Brisbane university complex is a popular place to visit and has good university facilities, such as societies, sports facilities, a number of university museums, a well-stocked bookshop and even its own cinema. The University of Queensland is the premier university throughout Queensland and is ranked fifth in the whole of Australia. Founded in 1909, by an Act of State Parliament commemorating the 50th anniversary of Queensland's separation from New South Wales, the University of Queensland opened its doors in 1911, with less that 100 students in Government House on George Street, Brisbane. In the late 1920s. 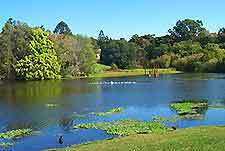 the University of Queensland moved to its current site at Victoria Park, which covers more than 100 hectares / 250 acres. 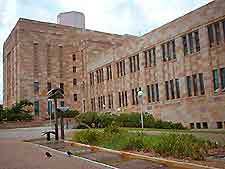 Brisbane's prestigious University of Queensland merged with the Queensland Agricultural College (UQ Gatton) in 1990 and now shares a modern university campus, with important state-of-the-art research facilities, more than 30,000 students each year, 5,000 staff and 300 buildings. Brisbane's University of Queensland is both the largest and oldest university in Queensland and over the years, many university graduates have become important leaders in their chosen industries. The information offices at the University of Queensland is situated close to the main entrance of Brisbane's university, in a small building nearby. With helpful staff and useful information about the University of Queensland, the information office features a map of the university complex and details about important, historic attractions. 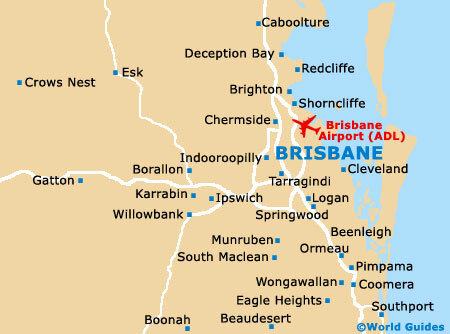 The Brisbane University of Queensland is easy to reach from Brisbane city centre and one of the most popular way to travel to the university is by cycling along the scenic Bicentennial Bikeway, which follows the western bank of the nearby Brisbane River from central Brisbane. Home to many historic buildings, including spectacular architecture with detailed pillars and arches, the University of Queensland (UQ) has many attractions for visitors to the campus. The University of Western Australia (UWA) has more than 150 societies, clubs and leisure activities, with many sport and recreation clubs covering a wide range of different sports. Some of the most popular sports clubs at Brisbane's University of Queensland (UQ) include sailing, surfing, athletics, rugby, football, hockey, tennis, golf, cycling and hiking, many of which take place at the university's excellent sports facilities and playing fields. 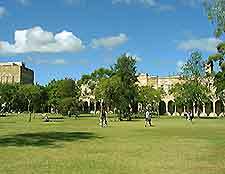 The University of Queensland (UQ) is centred around the picturesque Great Court, which is a spacious area of lawns, trees and shrubs, surrounded by a large semicircle of cloistered buildings made from sandstone. 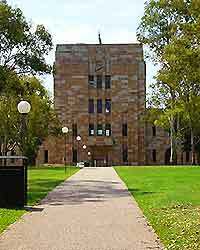 Other attractions at the University of Queensland include several interesting museums, which are open to the general public, such as the university's Anthropology Museum, Antiquity Museum and Zoology Museum. Visitors are always welcome at the University of Queensland and self-guided tours of the Brisbane university complex are available, allowing you to appreciate the university's rich heritage.